We all know that Robert De Niro has never cut corners when it comes to preparing for roles in films. Need him to gain 60 pounds to play the retired Jake LaMotta in Raging Bull? No problem. How about dropping down to a lean 4% body fat for Cape Fear? Consider it done. And while we're at it, let's pay a dentist $20k to grind the actor's teeth down, you know, to achieve the menacing look of Max Cady. When it comes to Taxi Driver, the least a method actor can do is learn to drive a cab. 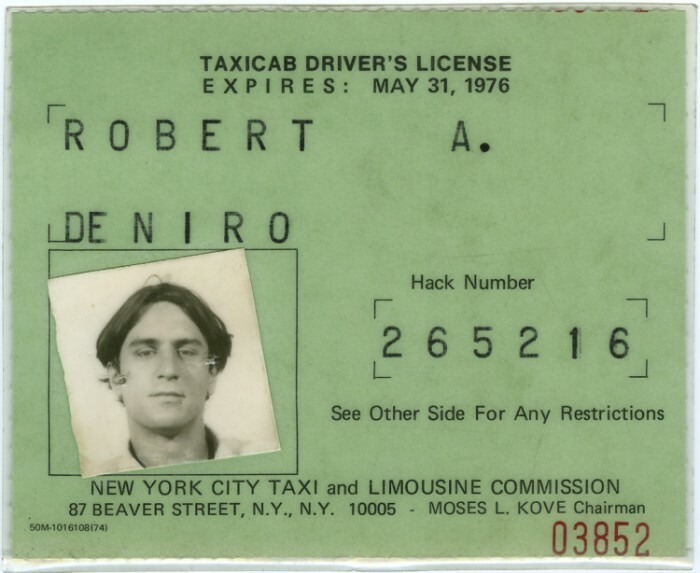 Above, behold the hack license obtained by Bobby D. in 1976. As part of De Niro's meticulous preparation for Taxi Driver, writes Andrew J. Rausch in The Films of Martin Scorsese and Robert De Niro, the actor spent some weekends as a cabbie. On one occasion, a passenger recognized him and asked him if he was Robert De Niro. The passenger, who also happened to be an actor, then quipped: "Well, that's acting. One year the Oscar, the next you're driving a cab!" (I'd really like to believe that story is true.) The license permanently resides at the Harry Ransom Center in Austin, Texas.